IL-10, an anti-inflammatory cytokine, has been shown to exhibit stimulatory functions including CD14 up-regulation on human monocytic cells. CD14-mediated signaling following LPS stimulation of monocytic cells results in the synthesis of proinflammatory cytokines. Our results show that LPS-induced CD14 expression on monocytic cells may be mediated by endogenously produced IL-10. To investigate the molecular mechanism by which IL-10 enhances CD14 expression, both human monocytes and the promyelocytic HL-60 cells were used as model systems. IL-10 induced the phosphorylation of PI3K and p42/44 ERK MAPK. By using specific inhibitors for PI3K (LY294002) and ERK MAPKs (PD98059), we demonstrate that LY294002 either alone or in conjunction with PD98059 inhibited IL-10-induced phosphorylation of STAT-1 and consequently CD14 expression. However, IL-10-induced STAT-3 phosphorylation remained unaffected under these conditions. Finally, STAT-1 interfering RNA inhibited IL-10-induced CD14 expression. Taken together, these results suggest that IL-10-induced CD14 up-regulation in human monocytic cells may be mediated by STAT-1 activation through the activation of PI3K either alone or in concert with the ERK MAPK. Interleukin-10, initially described as a cytokine synthesis inhibitory factor (1), is a pleiotropic cytokine whose effects primarily include the inhibition of APC-dependent cytokine synthesis by Th1 cells and associated inflammatory responses (2, 3, 4, 5). IL-10 is produced by a wide variety of cell types, including CD4+ Th0 and Th2 cells, CD8+ T cells, regulatory T cells, B cells, and monocytic cells (6, 7, 8). IL-10 inhibits the Ag-driven activity of both Th1 and Th2 subsets, and hence is not strictly a Th2-type cytokine, although it facilitates the induction of Th2 cell types (5, 7). IL-10 has been shown to down-regulate the release of reactive oxygen, nitrogen intermediates, and TNF-α, resulting in macrophage deactivation which may allow the growth of tumor cells and intracellular microbes (5, 9). The potent inhibitory action of IL-10 on macrophages, particularly at the level of cytokine production, supports an important role for IL-10 in the regulation of T cell responses and acute inflammation (5). In addition, IL-10 has been shown to stimulate a variety of biological functions such as costimulation of thymocyte growth in the presence of IL-2 and/or IL-4, and B cell growth and differentiation (5, 6, 10). Naive IgD+ B cells, when activated with anti-CD40 Abs, secrete IgG1 and IgG3 in the presence of IL-10 (6, 11). Furthermore, IL-10 acts as an autocrine growth factor for Ly-1+ B cells, which are important in murine models of autoimmune diseases (12). The molecular mechanism underlying IL-10-mediated inhibitory effects has been studied in a number of model systems. IL-10 interacts with its high-affinity receptor complex, which is expressed on most hemopoietic cell types (3, 13). The IL-10R is composed of two subunits, IL-10R1, the ligand binding subunit, and IL-10R2, the accessory subunit (3, 13). Engagement of the IL-10R complex with IL-10 activates the JAK-STAT signaling pathway. JAK-1 and Tyk-2 tyrosine kinases are constitutively associated with IL-10R1 and IL-10R2, respectively (3, 14). IL-10 induces tyrosine phosphorylation and activation of the latent transcription factors STAT-3 and STAT-1, and in nonmacrophage cells, STAT-5 (14, 15). STAT-3 is recruited directly to the IL-10R complex via either of two tyrosine residues present in the IL-10R1 cytoplasmic domain (14). Dimers of phosphorylated STAT-3 molecules translocate to the nucleus, resulting in gene regulation. IL-10 mediates its inhibitory effects on macrophage proliferation and TNF-α production through STAT-3 activation (13, 14). IL-10 has been shown to increase the expression of the cyclin-dependent kinase inhibitor p19INK4D in macrophages. The expression of p19INK4D was later shown to be dependent on STAT-3 activation (16, 17). Recently, the inhibitory effects of IL-10 have also been shown to involve the activation of the suppressor of cytokine signaling (SOCS)3 proteins, in particular, SOCS1 and SOCS3, in LPS- and IFN-γ-stimulated monocytic cells (18, 19). The induction of the SOCS3 gene has been attributed to STAT-3 activation (20), indicating that STAT-3 constitutes an important component of the mechanism by which IL-10 exerts its inhibitory effects. In contrast to STAT-3, the role of STAT-1 in the regulation of IL-10-mediated biological effects is not known. Macrophages from STAT-1 knockout mice were found to be responsive to IL-10 (21), and dominant-negative STAT-1 did not block IL-10-mediated effects in monocytic cells (17). Recently, IL-10 was shown to regulate cytokine production by monocytic cells through signaling pathways other than the JAK/STAT pathway. For example, IL-10 induced the activation of PI3K (22, 23) possibly through JAK-1 activation. There is evidence to suggest that JAK1 phosphorylates the insulin receptor substrate-1 (IRS-1) docking molecule following interaction of IL-2, IL-4, IL-10, and IFN-α with their corresponding receptors (23, 24). Subsequently, tyrosine-phosphorylated IRS-1 proteins may recruit the regulatory p85 subunit of PI3K to the plasma membrane through phospho-tyrosine-SH2 domain interactions (25). It was reported that specific inhibitors of PI3K inhibited the proliferative but not the anti-inflammatory activities of IL-10 (22). IL-10 was also shown to enhance the survival of astrocytes through PI3K activation (26). In addition, there is evidence to suggest that IL-10 can induce the activation of p38 and p42/44 ERK MAPK (23, 27, 28, 29). However, the role of MAPK in IL-10-mediated effects is not clear at present. In contrast to the IL-10-mediated inhibitory effects, there is little information regarding the molecular mechanism by which IL-10 exerts its stimulatory effects. We have previously demonstrated that LPS, a component of Gram-negative bacterial cell walls, induced CD14 expression (30). CD14 is the primary LPS receptor expressed on cells of the monomyelocytic lineage (31). The interaction of LPS with CD14 on monocytic cells plays a critical role in the activation of these cells during inflammation and sepsis (31). CD14 is one of the few surface receptors whose expression is enhanced by IL-10 on human monocytes (30). In this study, we investigated the molecular mechanism by which IL-10 induces up-regulation of surface CD14 by using primary human monocytes and promyelocytic HL-60 cells as model systems. We show for the first time that the stimulatory effect of IL-10 on CD14 expression in monocytic cells does not require STAT-3 activation but rather is regulated by a STAT-1-dependent pathway. Furthermore, IL-10-induced STAT-1 activation is mediated by the upstream PI3K activity either alone or in concert with ERK MAPK. HL-60, a promyelocytic cell line derived from a human acute promyelocytic leukemia patient, was obtained from the American Type Culture Collection. Cells were cultured in IMDM (Sigma-Aldrich) supplemented with 10% FBS (Invitrogen Life Technologies), penicillin (100 U/ml), gentamicin (100 μg/ml), HEPES (100 mM), and glutamine (2 mM). PD98059, an inhibitor of mitogen-activated protein/ERK kinase-1 kinase that selectively blocks the activity of ERK MAPK (32, 33), was purchased from Calbiochem. The pyridinyl imidazole, SB202190, a potent and specific inhibitor of p38 MAPK (33, 34), was also purchased from Calbiochem. SP600125, a specific JNK inhibitor (BIOMOL), is a reversible ATP competitive inhibitor with >300-fold selectivity over related MAPKs including ERK1 and p38 as well as protein kinase A and IκB kinase-2 (35). LY294002, a potent and specific PI3K inhibitor (36), was also obtained from Calbiochem. LPS derived from Escherichia coli 0111:B4 (Sigma-Aldrich), and rIL-10 and IL-10Rα Abs (R&D Systems) were also purchased. All other chemicals used for Western blotting were obtained from Sigma-Aldrich. PBMCs were prepared from blood obtained from healthy adult volunteers following approval of the protocol by the Ethics Review Committee of the Children’s Hospital of Eastern Ontario (Ottawa, Ontario, Canada). The PBMCs were isolated by density gradient centrifugation over Ficoll Hypaque (Amersham Biosciences), as previously described (28). Briefly, the cell layer containing mononuclear cells was collected and washed three times in PBS. Purified, nonactivated monocytes were isolated by negative selection by depletion of T cells and B cells using magnetic polystyrene M-450 Dynabeads coated with Abs specific for CD2 (T cells, NK cells) and CD19 (B cells) (Dynal Biotech), as described earlier (28, 37). CD2+CD19+ cells were separated magnetically from the CD2−CD19− cells. CD2−CD19− cells were incubated at 37°C for 2 h, following which nonadherent cells were removed. The adherent mononuclear cells obtained contained <1% CD2+ T cells and CD19+ B cells as determined by flow cytometry (28, 37). To determine the effect of p38, p42/44 ERKs, JNK, STAT-3, and PI3K specific inhibitors on IL-10-induced CD14 expression, monocytes (1.0 × 106 cells/ml) and HL-60 cells (0.5–1 × 106 cells/ml) were incubated with various concentrations of the MEK-1 inhibitor PD98059, the p38 MAPK inhibitor SB202190, the JNK inhibitor SP600125, a peptide (PpYLKTK-mts) inhibitor specific for STAT-3 (Calbiochem), or the PI3K inhibitor LY294002, for 2 h in 24-well culture plates (Falcon; BD Biosciences). Cells were left untreated or stimulated with LPS (1 μg/ml) or IL-10 (10 ng/ml) for 24 h in the presence or the absence of the above-mentioned inhibitors. The cells were then analyzed for CD14 expression by flow cytometry. CD14 expression on monocytes and HL-60 cells was determined by flow cytometry as previously described (30). Briefly, cells were stained with PE-conjugated anti-CD14 mAbs (BD Biosciences). Autofluorescence and isotype-matched control Abs, IgG2b (BD Biosciences), were also included. The gates were set in accordance with the gates obtained with the isotype-matched control Abs. Data were acquired on a BD Biosciences FACScan flow cytometer and analyzed using the WinMDI version 2.8 software package (J. Trotter, Scripps Institute, San Diego, CA). Phosphorylation of p38, p42/44 ERK and JNK MAPKs, STAT-3, STAT-1, and Akt was determined by Western blot analysis using phospho-MAPKs, phospho-STAT, and phospho-Akt specific Abs, respectively, as previously described (37, 38). Primary human monocytes and HL-60 cells were pretreated with indicated concentrations of inhibitors followed by stimulation at 37°C for 0–60 min with either 1 μg/ml LPS or 10 ng/ml IL-10. Subsequently, cells were immediately placed in ice followed by lysing the cell pellets at 4°C for 45 min with lysis buffer. The protein concentration of the supernatants was determined as per the Bradford method by using the Bio-Rad protein determination assay kit. Total cell proteins were subjected to electrophoresis on 10% polyacrylamide SDS gels. The polyvinylidene difluoride membranes (Bio-Rad) were probed with either rabbit anti-human phospho-p38 (Cell Signaling Technology), mouse anti-human-phospho-p42/44 (Santa Cruz Biotechnologies), rabbit anti-human phospho-JNK, rabbit anti-human phospho-Akt, rabbit anti-human phospho-STAT-1, and rabbit anti-human phospho-STAT-3 (Cell Signaling Technology) Abs followed by HRP-conjugated goat anti-rabbit or goat anti-mouse polyclonal Abs (Bio-Rad). The membranes were stripped of the primary Abs and reprobed with rabbit polyclonal Abs specific for the unphosphorylated forms of either p38, p42/44, JNK MAPKs (Santa Cruz), STAT-1, STAT-3, and Akt (Cell Signaling Technology) as described (37, 38). All immunoblots were visualized by ECL (Amersham Biosciences). HL-60 cells (0.25 × 106 cells/ml) were cultured in 12-well plates (Falcon) in serum-free IMDM. Cells were transfected with either 1 μg of siRNA specific for STAT-1 or control vector (Panomics) using Fugene 6 (Roche Applied Biosciences) as described by the manufacturer. The siRNA for STAT-1 was a mixture of up to three different plasmids. Briefly, the cells were washed once in PBS and then resuspended in serum-free IMDM. Fugene 6 was allowed to complex with 1 μg of the siRNA plasmids in a total volume of 100 μl of serum-free IMDM for 15 min before dropwise addition to the cell culture. Following transfection, cells were incubated in serum-free medium for 6 h and were cultured overnight for an additional 16 h with 2% FCS. IL-10 (10 ng/ml) was added 24 h after transfection, and following an additional 24-h period, the cells were harvested and analyzed for CD14 expression by flow cytometry. The EMSA was performed as described earlier (28, 37). Briefly, cells harvested in Tris-EDTA-saline buffer (pH 7.8) were lysed followed by collection of nuclear extracts essentially as described earlier (28, 37). Nuclear proteins (5 μg) were mixed for 20 min at room temperature with either 32P-labeled STAT-1 or STAT-3 oligonucleotide probes, and the complexes were subjected to nondenaturing 5% PAGE. The oligonucleotide sequence for STAT-3 was as follows: 5′-GAT CCT TCT GGG AAT TCC TAG ATC-3′ (Santa Cruz). To illustrate specificity of NF binding, parallel EMSA reactions were incubated with 50- to 200-fold excess of cold unlabelled probe. The supershift analyses were also performed to identify the bands containing STAT-3 by using specific mouse anti-STAT-3 (Santa Cruz) Abs. Briefly, nuclear extracts were incubated with the STAT-3 oligonucleotides in the presence of anti-STAT-3, or control Abs at a final concentration of 0.5–2 μg/ml. The bound and unbound 32P-labeled oligonucleotides were resolved by gel electrophoresis as described above. The gel was dried and exposed to x-ray film (Kodak). We confirmed our previous observations (30) that stimulation of primary monocytes with LPS enhanced CD14 expression (Fig. 1⇓). To determine whether endogenously produced IL-10 regulated LPS-induced CD14 expression, we used Abs specific for IL-10Rα (0.1 μg/ml) that are capable of neutralizing the biological activity of IL-10 (10 ng/ml), as described previously (28). 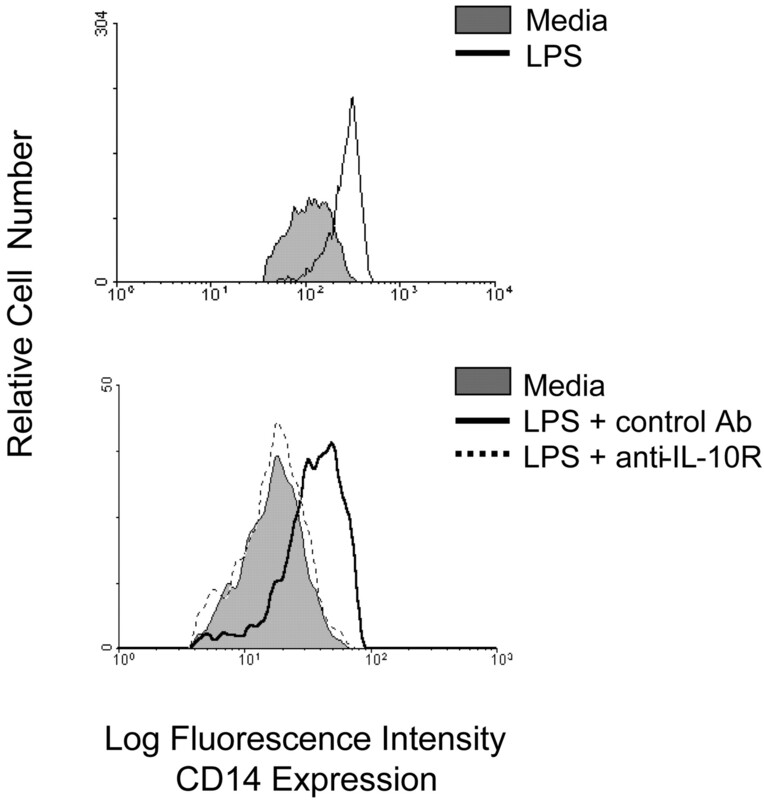 Anti-IL-10Rα Abs inhibited the LPS-induced CD14 expression (Fig. 1⇓), suggesting that endogenously produced IL-10 may mediate LPS-induced CD14 expression in monocytic cells. We have previously demonstrated that LPS-induced IL-10 production is regulated via the activation of p38 MAPKs (38). To investigate whether endogenously produced IL-10 following LPS stimulation plays a role in up-regulating CD14 expression, IL-10 production was inhibited by using the p38 inhibitor SB202190. As shown previously (38), LPS strongly induced p38 phosphorylation in monocytes, which could be abolished by pretreatment of cells with SB202190 (Fig. 2⇓A). Pretreatment of monocytes with SB202190 inhibited CD14 expression (Fig. 2⇓B) and concomitant IL-10 production (C) in a dose-dependent manner. In addition, stimulation of normal monocytes with exogenous IL-10 enhanced CD14 expression (Fig. 3⇓). Unstimulated cells expressed CD14 at considerable levels, and IL-10 stimulation was able to further up-regulate its expression (Fig. 3⇓). Taken together, these observations suggest that endogenously produced IL-10 plays an important role in LPS-induced CD14 expression in monocytic cells. 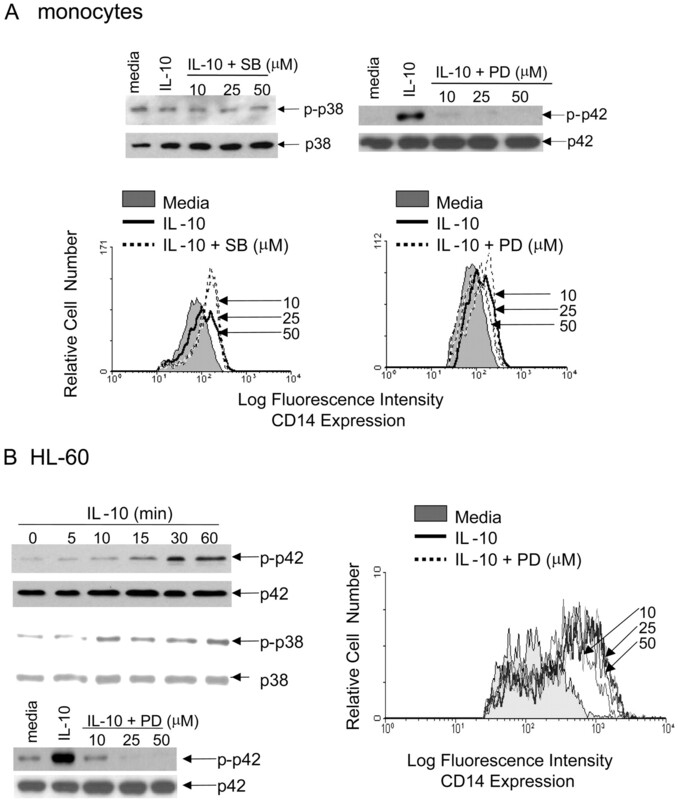 Endogenously produced IL-10 mediates LPS-induced CD14 expression in human monocytes. Purified monocytes (1 × 106/ml) were stimulated with either LPS (1 μg/ml) alone or LPS plus anti-IL-10Rα Abs or isotype-matched control Abs (0.1 μg/ml) for 24 h followed by flow cytometric analysis of CD14 expression. The results shown are representative of three independent experiments performed. LPS-induced CD14 expression is mediated by endogenously produced IL-10 that is regulated by p38 MAPK activation. A, Purified monocytes (1 × 106/ml) were pretreated with varying doses of SB202190 for 2 h before stimulation with LPS (1 μg/ml) for 10 min followed by analysis of p38 phosphorylation by Western blotting using anti-phospho-p38 Abs. The membrane was stripped and reprobed with total anti-p38 Abs to control for equal loading. B, SB202190-treated cells were stimulated with LPS (1 μg/ml) for 24 h followed by analysis of CD14 expression by flow cytometry. C, The supernatants harvested from LPS-stimulated cells were analyzed for IL-10 production by ELISA. The results shown are representative of three different experiments performed. IL-10 induces CD14 expression in human monocytes and in HL-60 cells. Purified monocytes (1 × 106/ml) and HL-60 cells (1 × 106/ml) were stimulated with IL-10 (10 ng/ml) for 24 h followed by analysis of CD14 expression by flow cytometry. The results shown are representative of five different experiments performed. To understand the molecular mechanism involved in the regulation of IL-10-induced CD14 expression, we examined a number of human monocytic cell lines including THP-1, U937, and HL-60, with a view to reproduce the stimulatory effect of IL-10 on CD14 expression, which could serve as a model system. HL-60 cells alone were found to be responsive to IL-10 and therefore were used to study IL-10-mediated CD14 up-regulation (Fig. 3⇑). It may be noted that HL-60 cells were heterogeneous with respect to CD14 expression and only 5–10% of cells responded by up-regulating CD14 expression in response to stimulation with IL-10 (Fig. 3⇑). The MAPKs play a major role in LPS- and cytokine-mediated induction of several cell surface receptors (39). We have previously demonstrated that IL-10 selectively induced the activation of p42/44 ERK MAPK in human monocytes (28, 37, 38). It was, therefore, of interest to identify the members of the MAPK family that may be involved in IL-10-induced CD14 expression. We first investigated the involvement of p38 and p42/44 MAPKs by examining their activation following stimulation of both monocytes and HL-60 cells with IL-10. IL-10 induced the phosphorylation of ERK MAPK from 10 to 30 min poststimulation in monocytes and HL-60 cells (Fig. 4⇓ and data not shown). Furthermore, the ERK-specific inhibitor PD98059 completely inhibited IL-10-induced activation of p42/44 MAPKs (Fig. 4⇓). In contrast, IL-10 failed to induce phosphorylation to a significant level of either p38 (Fig. 4⇓B) or JNK MAPKs (data not shown) in both monocytes and HL-60 cells. IL-10-induced CD14 expression is partially dependent on p42 ERK MAPK activation. A, Purified monocytes (1 × 106/ml) were pretreated with varying doses of either SB202190 (SB) or PD98059 (PD) for 2 h before stimulation with IL-10 (10 ng/ml) for 10 min. Cell lysates were analyzed for phosphorylation of p38 or p42 MAPK by Western blot analysis by anti-phospho-p38 or -p42/44 Abs, respectively, as described in the legend to Fig. 2⇑ (upper panel). The cells pretreated with MAPK inhibitors were also stimulated with IL-10 (10 ng/ml) for 24 h and analyzed for CD14 expression by flow cytometry (lower panel). 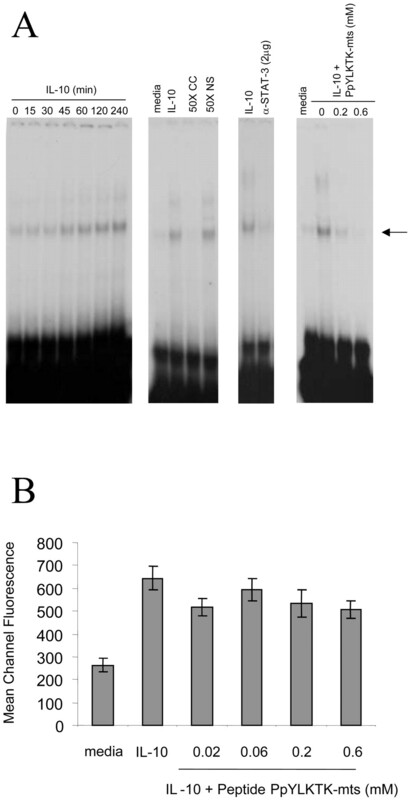 B, HL-60 cells were stimulated with IL-10 for 5–60 min, and the cell lysates were analyzed for p38 and p42 MAPK activation by Western blotting with phosphospecific Abs (upper left panel). HL-60 cells were pretreated with varying doses of PD98059 (10–50 μM) for 2 h before IL-10 stimulation for 10 min followed by Western blotting analysis for phospho-p42 ERK (lower left panel). Cells pretreated with PD98059 were also analyzed for CD14 expression by flow cytometry after IL-10 stimulation for 24 h (right panel). The results shown are representative of three different experiments performed. To determine the role of ERK MAPK in IL-10-induced CD14 expression, monocytes and HL-60 cells were pretreated with PD98059 for 2 h before IL-10 stimulation for 24 h followed by analysis of CD14 expression. 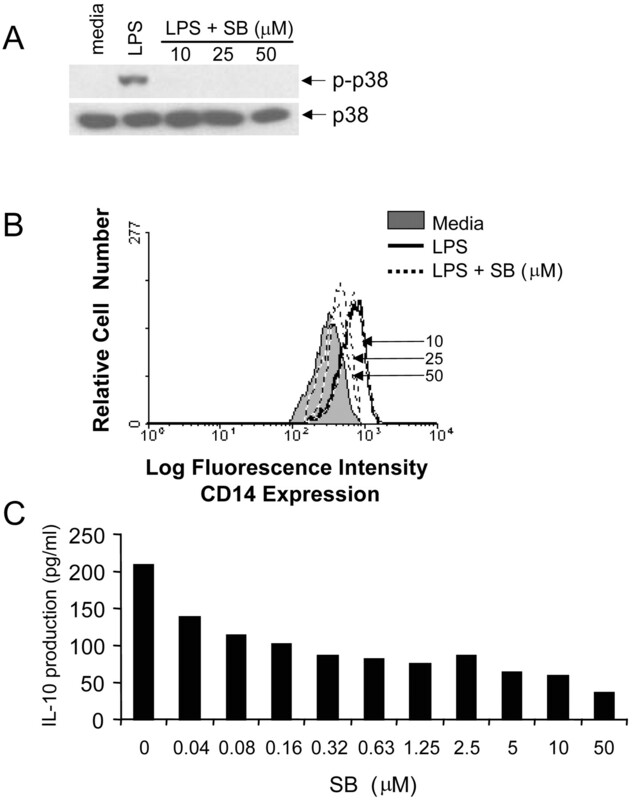 PD98059 partially inhibited CD14 expression in monocytes (mean channel fluorescence from 347 to 320) and in HL-60 cells (mean channel fluorescence from 248 to 214) (Fig. 4⇑). As a negative control, treatment with SB202190 did not affect CD14 expression in monocytes (Fig. 4⇑A) and HL-60 cells (data not shown). The above observations suggest that IL-10-induced CD14 expression may be regulated by signaling molecules other than the ERK MAPK either independently or in synergy with the ERK MAPKs. IL-10 has been shown to activate the PI3K pathway, which has been suggested to regulate the biological effects of IL-10 (22, 23). To investigate the role of PI3K in IL-10-induced CD14 expression, we first determined whether IL-10 can activate Akt, the downstream substrate for PI3K, and if so, whether the PI3K-specific inhibitor, LY294002, can inhibit IL-10-induced Akt activation. The results show that IL-10 induced strong phosphorylation of Akt in both monocytes and HL-60 cells at 60 min poststimulation that was inhibited by LY294002 in a dose-dependent manner (Fig. 5⇓, A and B). PI3K and p42-MAPK synergistically induce CD14 expression in response to IL-10 in monocytic cells. A, Purified monocytes (1 × 106/ml) and HL-60 cells (0.5 × 106/ml) were stimulated with IL-10 (10 ng/ml) for 5–60 min. B and C, Monocytes (B) and HL-60 cells (C) were pretreated with varying doses of LY294002 followed by stimulation with IL-10 for 10 min in monocytes and 30 min in HL-60 cells (upper blots in B and C). Cell lysates were analyzed for Akt phosphorylation by using anti-phospho-Akt Abs as described in the legend to Fig. 2⇑. To determine the synergistic effect of PI3K and p42 ERK MAPK activation, cells were pretreated with either LY294002 or PD98059 alone or in combination for 2 h followed by IL-10 (10 ng/ml) stimulation for 24 h. CD14 expression was analyzed by flow cytometry (lower panel in B and C). The results shown are representative of three different experiments performed. To determine the role of PI3K in IL-10-induced CD14 expression, both monocytes and HL-60 cells were treated with LY294002 for 2 h before stimulation with IL-10 for 24 h followed by analysis of CD14 expression. Treatment of monocytes and HL-60 cells with increasing concentrations of LY294002 only partially inhibited IL-10-induced CD14 expression even though LY294002 completely inhibited Akt phosphorylation (Fig. 5⇑, B and C). Because partial inhibition of CD14 expression was observed with both ERK- and PI3K-specific inhibitors, we hypothesized that ERK and PI3K may cooperate to regulate IL-10-induced CD14 expression. For this, both monocytes and HL-60 cells were pretreated with varying concentrations of LY294002 either alone or in combination with PD98059 for 2 h before stimulation with IL-10 followed by analysis of Akt phosphorylation and CD14 expression. As expected, LY294002 inhibited Akt phosphorylation at low doses (10 mM), and PD98050 did not influence Akt activation (Fig. 5⇑, B and C). Interestingly, the combination of ERK and PI3K inhibitors even at low concentrations completely inhibited the increase in levels of CD14 expression (Fig. 5⇑C), suggesting that IL-10-induced CD14 expression may be regulated by PI3K and ERK MAPK in a synergistic manner. It may be noted that treatment of cells with a combination of the inhibitors LY294002 and PD98059 at concentrations used did not affect cell viability as determined by trypan blue staining (data not shown). IL-10 has been shown to regulate its effects primarily through the activation of STAT-3 (13, 14, 16, 17). Therefore, it was important to determine whether IL-10-induced CD14 expression is regulated by STAT-3 activation directly or indirectly through the ERK/PI3K-mediated activation. For this, cells were treated with various concentrations of PD98059 either alone or in combination with different concentrations of LY294002 for 2 h before stimulation with IL-10. PD98059 either alone or in combination with LY294002 at any concentration did not down-regulate STAT-3 phosphorylation in either monocytes or HL-60 cells (Fig. 6⇓). To determine the involvement of STAT-3 in IL-10-induced CD14 expression, we used a specific peptide inhibitor (PpYLKTK-mts) of STAT-3. The PpYLKTK-mts peptide mediates its effect by preventing dimerization of STAT-3 proteins and subsequent translocation into the nucleus (40). The biological activity of the PpYLKTK-mts peptide was measured by examining the STAT-3 translocation into the nucleus following stimulation with IL-10 by performing a gel shift assay. IL-10 induced maximum STAT-3 activation at 2–4 h poststimulation (Fig. 7⇓A). IL-10 stimulation resulted in the induction of a single band whose specificity was confirmed by cold competition with STAT-3 oligonucleotides, which specifically inhibited this band, whereas unlabeled nonspecific oligonucleotides did not affect the intensity of this band. In addition, treatment of nuclear extracts obtained from IL-10-stimulated cells with anti-STAT-3 Abs resulted in abrogation of this band. HL-60 cells were pretreated with the PpYLKTK-mts peptide inhibitor for 2 h before stimulation with IL-10 for 2 h followed by analysis of STAT-3 induction. The PpYLKTK-mts peptide inhibited STAT-3 induction following IL-10 stimulation in a dose-dependent manner (Fig. 7⇓A). To determine the effect of PpYLKTK-mts peptide on IL-10-induced CD14 expression, HL-60 cells were treated with varying concentrations of PpYLKTK-mts peptide for 2 h before stimulation with IL-10. The PpYLKTK-mts peptide did not affect CD14 expression at any concentration in HL-60 cells (Fig. 7⇓B) or monocytes (data not shown). IL-10-induced CD14 expression is not regulated via STAT-3 activation. A, HL-60 cells were treated with IL-10 (10 ng/ml) for 0–240 min, and the nuclear extracts were analyzed for STAT-3 activation by EMSA (left panel). The nuclear extracts were incubated with unlabelled STAT-3-specific (CC) or with nonspecific (NS) oligonucleotides (middle left panel). Nuclear extracts were also incubated with anti-STAT-3 Ab for supershift analysis (middle right panel). HL-60 cells were pretreated with a STAT-3-specific inhibitor peptide (PpYLKTK-mts) at two different concentrations for 2 h before IL-10 (10 ng/ml) stimulation for 2 h (right panel). The STAT-3-specific band is indicated by the arrow. B, HL-60 cells were pretreated with a STAT-3-specific inhibitor peptide (PpYLKTK-mts) at varying doses for 2 h before IL-10 (10 ng/ml) stimulation for 24 h. CD14 expression was analyzed by flow cytometry. The results are expressed as mean channel fluorescence of two experiments performed. In addition to STAT-3, IL-10 has been shown to activate STAT-1 through the JAK signaling pathway (14, 15). However, the role of STAT-1 in IL-10-mediated biological effects is not known. Because IL-10-induced CD14 expression was not found to be regulated by STAT-3 activation, we hypothesized that IL-10 may stimulate CD14 expression through ERK/PI3K-mediated activation of STAT-1. Using a similar experimental design, cells were treated with various concentrations of PD98059 either alone or in combination with different concentrations of LY294002 for 2 h before stimulation with IL-10, following which cells were analyzed for STAT-1 phosphorylation. 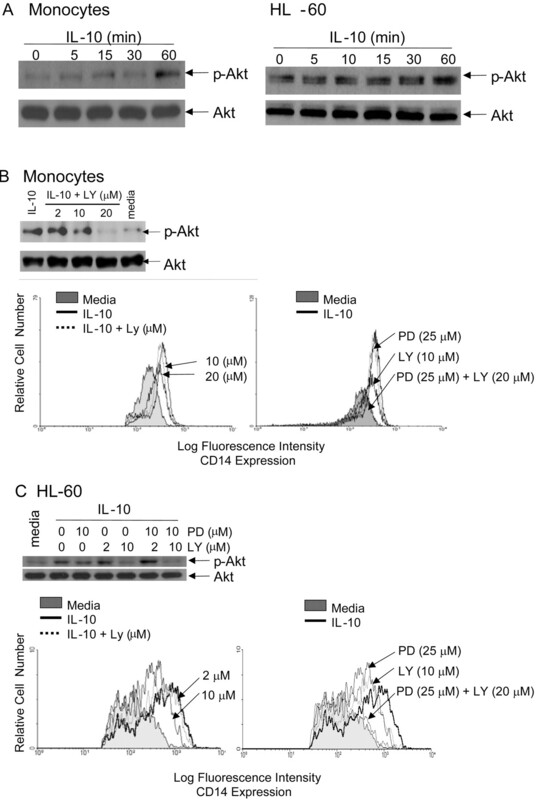 LY294002 inhibited IL-10-induced STAT-1 phosphorylation in both monocytes and HL-60 cells. Furthermore, STAT-1 phosphorylation was completely inhibited when LY294002 was used in combination with PD98059 in a dose-dependent manner (Fig. 8⇓A). These results suggest that IL-10-induced STAT-1 activation may be mediated by the synergistic action of PI3K and ERK. IL-10-induced CD14 expression is dependent on PI3K- and ERK MAPK-induced STAT-1 activation. A, Purified monocytes (upper panel) and HL-60 cells (lower panel) were pretreated with varying doses of either LY294002 or PD98059 alone or in combination for 2 h before stimulation with IL-10 (10 ng/ml) for 10 min in monocytes and 30 min in HL-60 cells. Cell lysates were analyzed for STAT-1 phosphorylation using anti-phospho-STAT-1 Abs as described above. 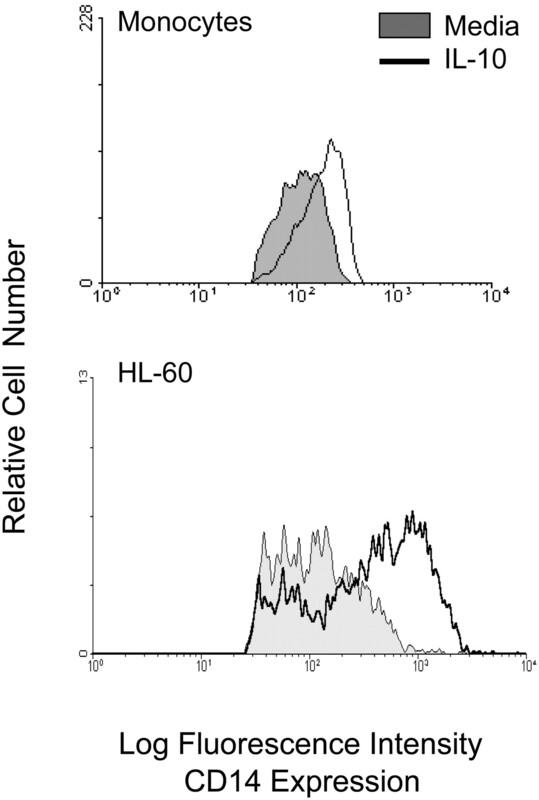 B, Purified monocytes (left panel) or HL-60 cells (right panel) were treated with IL-10 for 0–60 min. Cell lysates were analyzed for serine 727 phosphorylation through the use of rabbit anti-phospho-STAT-1 serine 727-specific Abs. The blots were stripped and reprobed with anti-phospho-STAT-3 Abs as a control for IL-10 activity and with anti-STAT-3 Abs as a loading control. C, HL-60 cells were transiently transfected with vectors containing siRNAs specific for STAT-1 or control plasmids. Following 24 h of transfection, cells were stimulated with IL-10 (10 ng/ml) for 30 min, following which lysates were analyzed for STAT-1 phosphorylation and expression of STAT-1 and STAT-3 by Western blotting by using anti-phospho-STAT-1, anti-STAT-1, and anti-STAT-3 Abs, respectively. D, HL-60 cells were transiently transfected with vectors containing STAT-1 siRNAs or control vectors. Following 24 h of transfection, cells were stimulated with IL-10 (10 ng/ml) followed by analysis of CD14 expression. The results shown are representative of three different experiments performed. Recently, phosphorylation of STAT-1 on serine residue 727 was implicated in STAT-1-mediated effects (41, 42). To determine whether serine 727 phosphorylation was induced by IL-10 in monocytic cells, we treated purified monocytes and HL-60 cells with IL-10 for 0–60 min. Neither monocytes (left panel) nor HL-60 cells (right panel) showed any induction of serine 727 phosphorylation in response to IL-10, even though STAT-3 phosphorylation was observed in the same lysates (Fig. 8⇑B). To more directly determine whether IL-10 stimulates CD14 expression through STAT-1 activation, HL-60 cells were transfected with either STAT-1 siRNA plasmids or a control plasmid. First, we determined whether transfection with STAT-1 siRNA plasmid affected the expression and the phosphorylation of STAT-1 in IL-10-stimulated cells. Cells transfected and cultured for 24 h were stimulated with IL-10 for 30 min and analyzed for STAT-1 expression and STAT-1 phosphorylation. Transfection of HL-60 cells with STAT-1 siRNA plasmids inhibited both IL-10-induced STAT-1 phosphorylation as well as STAT-1 expression compared with the cells transfected with a control plasmid (Fig. 8⇑C). As a loading control and to determine specificity, transfection of cells with STAT-1 siRNA did not reduce STAT-3 expression. To determine whether STAT-1 inactivation influenced CD14 expression, cells were analyzed for CD14 expression 24 h after transfection by flow cytometry. IL-10 failed to stimulate CD14 expression in cells transfected with STAT-1 siRNA plasmid compared with the cells transfected with the control plasmid (Fig. 8⇑D). In general, IL-10-mediated inhibitory effects on cell proliferation and synthesis of proinflammatory cytokines have been shown to be regulated through STAT-3 activation (13, 14, 16, 17). However, in contrast to STAT-3, the role of STAT-1 in regulating IL-10-mediated biological effects remains to be established. In this study, we investigated the signaling pathways involved in the IL-10-induced stimulatory effect on CD14 expression in human monocytic cells. Our results show for the first time that IL-10-induced CD14 expression is mediated by a mechanism involving STAT-1 activation independent of STAT-3. Furthermore, IL-10-activated STAT-1 is regulated through PI3K activation either alone or in concert with the ERK MAPKs. LPS stimulates monocytic cells through its association with the plasma LPS-binding protein, following which the LPS/LPS-binding protein complex interacts with the CD14/Toll receptor complex expressed on surface membrane (43). The levels of CD14 expression on monocytic cells may determine their responsiveness to the synthesis of proinflammatory cytokines and costimulatory molecules. CD14 transgenic mice were found to be hypersensitive to endotoxins (44), suggesting a critical role for CD14 in the immunopathogenesis of sepsis. In addition, elevated levels of circulating soluble CD14 (sCD14) were observed in inflammatory conditions such as systemic lupus erythematosus, chronic active hepatitis, and septic shock (45, 46, 47). Enhanced levels of sCD14 in plasma and other body fluids may neutralize the endotoxin content in septic patients (48). In this study, we show that LPS-induced CD14 expression on monocytic cells may be regulated, at least in part, by the endogenously produced IL-10. In view of the observations that IL-10 enhances sCD14 levels (30), LPS-induced CD14 expression through endogenously produced IL-10 suggests that IL-10 may act as an anti-inflammatory agent by neutralizing endotoxin, and hence decreasing host susceptibility to bacterial infections (49). The signaling molecules involved in IL-10-induced CD14 expression are not known. Interaction of IL-10 with its receptor complex initiates a cascade of events leading to the tyrosine phosphorylation of JAK1 and Tyk2 tyrosine kinases that is followed by the recruitment and phosphorylation of STAT-3 and STAT-1 (13, 14). Binding of STAT-3 to the phosphotyrosine residues of the activated IL-10R complex is required for STAT-3 activation and dimerization, and consequent manifestation of a number of biological effects of IL-10 (14, 16, 17). We provide evidence that IL-10-induced CD14 expression is mediated not through STAT-3, but through STAT-1 activation in monocytic cells. STAT-1 plays a critical role in IFN-γ-mediated biological effects such as antiproliferative responses, immune surveillance, and tumor suppression (50). The role of STAT-1 in biological responses has been studied by using STAT-1−/− mice. Although STAT-1−/− mice develop normally, they fail to elicit biological responses to IFN-γ or IFN-α (21, 51), exhibit impaired development of regulatory T cells (52), and develop tumors rapidly and with greater frequency following challenge with chemical carcinogens (53). However, macrophages from STAT-1−/− mice were shown to be responsive to IL-10 (21), and overexpression of dominant-negative STAT-1 did not block IL-10-induced effects in a macrophage cell line (17), suggesting that STAT-1 may not be involved in IL-10-mediated biological effects. However, these studies did not fully address the role of STAT-1 in IL-10-mediated biological effects. Our results show that IL-10-induced up-regulation of CD14 is mediated by STAT-1 through the activation of PI3K in monocytic cells. This was demonstrated first by using the PI3K and ERK MAPK inhibitors, LY294002 and PD98059, respectively, which inhibited IL-10-induced STAT-1 phosphorylation without affecting STAT-3 activation and consequently CD14 expression. Second, STAT-1 siRNA inhibited IL-10-induced CD14 expression. Finally, LY294002 and PD98059 inhibited STAT-1 binding to its binding site in the CD14 promoter (data not shown). Recently, it has been shown that JAK proteins can also activate other signaling molecules especially from the PI3K family. For example, JAK1 activated by either IL-4, IFN-α, IL-10, or Oncostatin-M activates the p85 subunit of PI3K through tyrosine phosphorylation of the IRS-1 docking molecule (23, 24). In this study, IL-10 stimulation of monocytic cells induced the activation of the survival enzyme, Akt-1, the signaling molecule downstream of PI3K. It has been suggested that Akt activation by IL-10 is required to promote cell proliferation and cell survival, but not to suppress the synthesis of the proinflammatory cytokine TNF-α (22, 26). Our studies showing the involvement of PI3K in IL-10-induced CD14 expression suggest that PI3K may be involved in the stimulatory effects of IL-10 and further support the notion that IL-10 stimulation may involve the activation of distinct signaling pathways that may determine either an inhibitory or a stimulatory outcome. However, additional studies are needed to address the role of PI3K and/or STAT-1 as a key mediator of IL-10-induced stimulatory effects. The observations that IL-10 induced STAT-1 activation via PI3K suggest that IL-10-induced PI3K may directly interact and contribute to STAT-1 activation. Similar interactions have been reported for activation of STAT-1 and STAT-3 by PI3K in IFN signaling. The p85 subunit of PI3K was shown to bind tyrosine-phosphorylated STAT-3 through p85 SH2 domains in IFN-α-activated cells (54). STAT-3 bound a conserved sequence at Tyr527 and Tyr538 of IFN-R type I and underwent IFN-dependent phosphorylation at residues Tyr656 and Tyr705. The p85 subunit bound to the phosphorylated STAT-3 recruited the catalytic p110 subunit of PI3K, an enzyme known to activate a series of serine kinases. This interaction induces activation of PI3K and promotes serine phosphorylation of STAT-3, which is critical for the formation of stable STAT-3 homodimers and their translocation into the nuclei (54). Similarly, PI3K and its effector kinase, Akt, have been shown to play an important role in the serine phosphorylation of STAT-1 (serine 727) and in the activation of IFN-γ-responsive genes (55). The finding that IL-10 selectively induced ERK MAPK activation in both monocytes and HL-60 cells was unexpected. Whether IL-10-induced activation of ERK MAPKs has a broader role in IL-10 signaling is not clear. IL-10 has been shown to activate p38 and ERK MAPKs in murine macrophages that were implicated in the expression of heme oxygenase (27) and apoptosis (23), respectively. The upstream signaling events required in the activation of ERK MAPK by IL-10 are not known. The signaling molecules and the transcription factors involved in the regulation of CD14 transcription are not well understood. The human CD14 promoter has been cloned and the sequence responsible for transcription in response to LPS have been elucidated (56). CD14 expression was shown to be regulated primarily by the Sp-1 transcription factor in human monocytic cells (56). Analysis of the CD14 promoter sequence revealed the presence of a consensus STAT-1 binding site (56). Consistent with this analysis, our results suggest that IL-10-induced CD14 expression is regulated by the STAT-1 transcription factor (data not shown). Although we demonstrate a role for STAT-1 in IL-10-induced CD14 induction, the role of other transcription factors, particularly Sp-1, cannot be ruled out. STAT-1 has been shown to cooperate physically and functionally with coactivator proteins such as CBP/p300, BRCA1, Sp-1, AP-1, and NFκB (50, 57, 58, 59). Whether STAT-1 induces CD14 expression in response to IL-10 stimulation through cooperative action with Sp-1 remains to be understood. In summary, we demonstrate a previously unrecognized role of STAT-1 in IL-10-induced signaling in human monocytic cells. IL-10 has been shown to mediate its inhibitory effects in general through the activation of STAT-3. However, there is emerging evidence from several laboratories that the STAT-3-dependent pathway is not sufficient to mediate the anti-inflammatory effects of IL-10. Furthermore, the molecular mechanisms regulating the stimulatory effects of IL-10 on various cell types including B cells and monocytic cells are poorly understood. Taken together, our results point to the key role for STAT-1 and its activation via the PI3K/ERK MAPKs in the regulation of IL-10 stimulatory effects on CD14 expression in human monocytic cells. These studies may provide a basis for the identification of molecular players in IL-10 signaling pathways that may help in designing targeted drug therapy for inflammatory diseases. Drs. J. Angel, M. Kryworuchko, and M. Kozlowski are gratefully acknowledged for critically reading the manuscript. ↵1 This work was supported by grants from the Ontario HIV Treatment Network (OHTN) and the Canadian Institute of Health Research (CIHR) (to A.K.). A.K. is a recipient of the Career Scientist Award from the OHTN. K.G. was supported by a fellowship from the OHTN and a scholarship from the CIHR. W.L. and S.M. were supported by fellowships from the Ontario Graduate Scholarship program and the Ontario Graduate Scholarships in Science and Technology program, respectively. A.A.R.R. was supported by the Ministry of Health, Government of Iran. ↵3 Abbreviations used in this paper: SOCS, suppressor of cytokine signaling; IRS-1, insulin receptor substrate-1; siRNA, short interfering RNA; s, soluble. Vieira, P., R. de Waal-Malefyt, M. N. Dang, K. E. Johnson, R. Kastelein, D. F. Fiorentino, J. E. deVries, M. G. Roncarolo, T. R. Mosmann, K. W. Moore. 1991. Isolation and expression of human cytokine synthesis inhibitory factor cDNA clones: homology to Epstein-Barr virus open reading frame BCRFI. Proc. Natl. Acad. Sci. USA 88: 1172-1176. Moore, K. W., M. R. de Waal, R. L. Coffman, A. O’Garra. 2001. Interleukin-10 and the interleukin-10 receptor. Annu. Rev. Immunol. 19: 683-765.
de Waal Malefyt, R., J. Haanen, H. Spits, M. G. Roncarolo, A. te Velde, C. Figdor, K. Johnson, R. Kastelein, H. Yssel, J. E. de Vries. 1991. Interleukin 10 (IL-10) and viral IL-10 strongly reduce antigen-specific human T cell proliferation by diminishing the antigen-presenting capacity of monocytes via downregulation of class II major histocompatibility complex expression. J. Exp. Med. 174: 915-924. Rousset, F., E. Garcia, T. Defrance, C. Peronne, N. Vezzio, D. H. Hsu, R. Kastelein, K. W. Moore, J. Banchereau. 1992. Interleukin 10 is a potent growth and differentiation factor for activated human B lymphocytes. Proc. Natl. Acad. Sci. USA 89: 1890-1893. Del Prete, G., M. De Carli, F. Almerigogna, M. G. Giudizi, R. Biagiotti, S. Romagnani. 1993. Human IL-10 is produced by both type 1 helper (Th1) and type 2 helper (Th2) T cell clones and inhibits their antigen-specific proliferation and cytokine production. J. Immunol. 150: 353-360. Daftarian, P. M., A. Kumar, M. Kryworuchko, F. Diaz-Mitoma. 1996. IL-10 production is enhanced in human T cells by IL-12 and IL-6 and in monocytes by tumor necrosis factor-α. J. Immunol. 157: 12-20. Mocellin, S., M. C. Panelli, E. Wang, D. Nagorsen, F. M. Marincola. 2003. The dual role of IL-10. Trends Immunol. 24: 36-43. Briere, F., C. Servet-Delprat, J. M. Bridon, J. M. Saint-Remy, J. Banchereau. 1994. Human interleukin 10 induces naive surface immunoglobulin D+ (sIgD+) B cells to secrete IgG1 and IgG3. J. Exp. Med. 179: 757-762. Ishida, H., R. Hastings, J. Kearney, M. Howard. 1992. Continuous anti-interleukin 10 antibody administration depletes mice of Ly-1 B cells but not conventional B cells. J. Exp. Med. 175: 1213-1220. Riley, J. K., K. Takeda, S. Akira, R. D. Schreiber. 1999. Interleukin-10 receptor signaling through the JAK-STAT pathway: requirement for two distinct receptor-derived signals for anti-inflammatory action. J. Biol. Chem. 274: 16513-16521. Weber-Nordt, R. M., J. K. Riley, A. C. Greenlund, K. W. Moore, J. E. Darnell, R. D. Schreiber. 1996. Stat3 recruitment by two distinct ligand-induced, tyrosine-phosphorylated docking sites in the interleukin-10 receptor intracellular domain. J. Biol. Chem. 271: 27954-27961. Finbloom, D. S., K. D. Winestock. 1995. 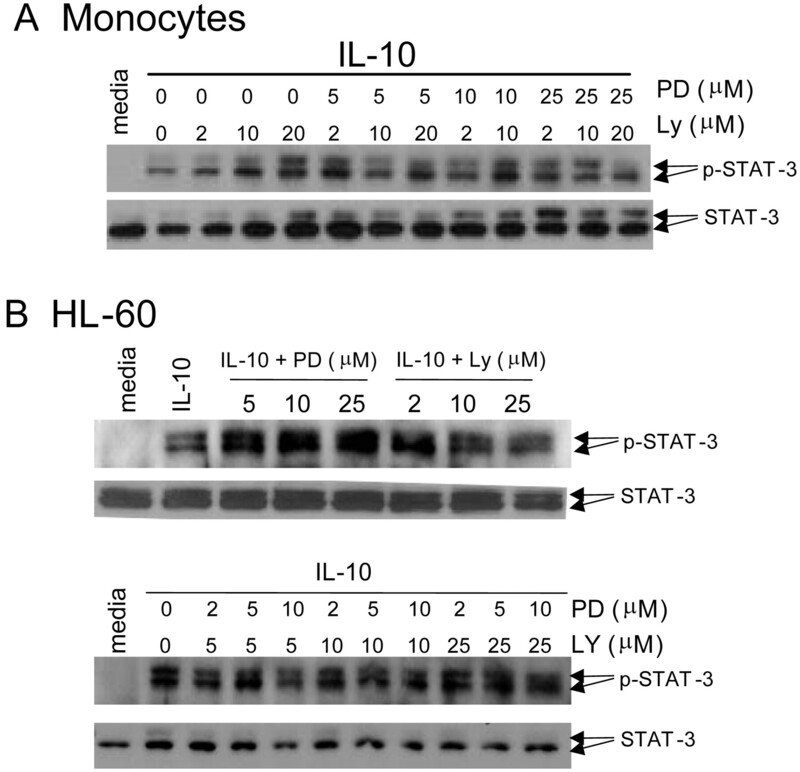 IL-10 induces the tyrosine phosphorylation of tyk2 and Jak1 and the differential assembly of STAT1α and STAT3 complexes in human T cells and monocytes. J. Immunol. 155: 1079-1090. O’Farrell, A. M., D. A. Parry, F. Zindy, M. F. Roussel, E. Lees, K. W. Moore, A. L. Mui. 2000. Stat3-dependent induction of p19INK4D by IL-10 contributes to inhibition of macrophage proliferation. J. Immunol. 164: 4607-4615. O’Farrell, A. M., Y. Liu, K. W. Moore, A. L. Mui. 1998. IL-10 inhibits macrophage activation and proliferation by distinct signaling mechanisms: evidence for Stat3-dependent and -independent pathways. EMBO J. 17: 1006-1018. Berlato, C., M. A. Cassatella, I. Kinjyo, L. Gatto, A. Yoshimura, F. Bazzoni. 2002. Involvement of suppressor of cytokine signaling-3 as a mediator of the inhibitory effects of IL-10 on lipopolysaccharide-induced macrophage activation. J. Immunol. 168: 6404-6411. Ding, Y., D. Chen, A. Tarcsafalvi, R. Su, L. Qin, J. S. Bromberg. 2003. Suppressor of cytokine signaling 1 inhibits IL-10-mediated immune responses. J. Immunol. 170: 1383-1391. Gatto, L., C. Berlato, V. Poli, S. Tininini, I. Kinjyo, A. Yoshimura, M. A. Cassatella, F. Bazzoni. 2004. Analysis of SOCS-3 promoter responses to interferon-γ. J. Biol. Chem. 279: 13746-13754. Crawley, J. B., L. M. Williams, T. Mander, F. M. Brennan, B. M. Foxwell. 1996. Interleukin-10 stimulation of phosphatidylinositol 3-kinase and p70 S6 kinase is required for the proliferative but not the antiinflammatory effects of the cytokine. J. Biol. Chem. 271: 16357-16362. Zhou, J. H., S. R. Broussard, K. Strle, G. G. Freund, R. W. Johnson, R. Dantzer, K. W. Kelley. 2001. IL-10 inhibits apoptosis of promyeloid cells by activating insulin receptor substrate-2 and phosphatidylinositol 3′-kinase. J. Immunol. 167: 4436-4442. Burfoot, M. S., N. C. Rogers, D. Watling, J. M. Smith, S. Pons, G. Paonessaw, S. Pellegrini, M. F. White, I. M. Kerr. 1997. Janus kinase-dependent activation of insulin receptor substrate 1 in response to interleukin-4, oncostatin M, and the interferons. J. Biol. Chem. 272: 24183-24190. Deane, J. A., D. A. Fruman. 2004. Phosphoinositide 3-kinase: diverse roles in immune cell activation. Annu. Rev. Immunol. 22: 563-598. Pahan, K., M. Khan, I. Singh. 2000. Interleukin-10 and interleukin-13 inhibit proinflammatory cytokine-induced ceramide production through the activation of phosphatidylinositol 3-kinase. J. Neurochem. 75: 576-582. Lee, T. S., L. Y. Chau. 2002. Heme oxygenase-1 mediates the anti-inflammatory effect of interleukin-10 in mice. Nat. Med. 8: 240-246. Lim, W., W. Ma, K. Gee, S. Aucoin, D. Nandan, F. Diaz-Mitoma, M. Kozlowski, A. Kumar. 2002. Distinct role of p38 and c-Jun N-terminal kinases in IL-10-dependent and IL-10-independent regulation of the costimulatory molecule B7.2 in lipopolysaccharide-stimulated human monocytic cells. J. Immunol. 168: 1759-1769. Gee, K., W. Lim, W. Ma, D. Nandan, F. Diaz-Mitoma, M. Kozlowski, A. Kumar. 2002. Differential regulation of CD44 expression by lipopolysaccharide (LPS) and TNF-α in human monocytic cells: distinct involvement of c-Jun N-terminal kinase in LPS-induced CD44 expression. J. Immunol. 169: 5660-5672. Creery, D., J. B. Angel, S. Aucoin, W. Weiss, W. D. Cameron, F. Diaz-Mitoma, A. Kumar. 2002. Nef protein of human immunodeficiency virus and lipopolysaccharide induce expression of CD14 on human monocytes through differential utilization of interleukin-10. Clin. Diagn. Lab. Immunol. 9: 1212-1221. Triantafilou, M., K. Triantafilou. 2002. Lipopolysaccharide recognition: CD14, TLRs and the LPS-activation cluster. Trends Immunol. 23: 301-304. Lewis, T. S., P. S. Shapiro, N. G. Ahn. 1998. Signal transduction through MAP kinase cascades. Adv. Cancer Res. 74: 49-139. Lee, J. C., P. R. Young. 1996. Role of CSB/p38/RK stress response kinase in LPS and cytokine signaling mechanisms. J. Leukocyte Biol. 59: 152-157. Vlahos, C. J., W. F. Matter, K. Y. Hui, R. F. Brown. 1994. A specific inhibitor of phosphatidylinositol 3-kinase, 2-(4-morpholinyl)-8-phenyl-4H-1-benzopyran-4-one (LY294002). J. Biol. Chem. 269: 5241-5248. Ma, W., K. Gee, W. Lim, K. Chambers, J. B. Angel, M. Kozlowski, A. Kumar. 2004. Dexamethasone inhibits IL-12p40 production in lipopolysaccharide-stimulated human monocytic cells by down-regulating the activity of c-Jun N-terminal kinase, the activation protein-1, and NF-kappa B transcription factors. J. Immunol. 172: 318-330. Dong, C., R. J. Davis, R. A. Flavell. 2002. MAP kinases in the immune response. Annu. Rev. Immunol. 20: 55-72. Turkson, J., D. Ryan, J. S. Kim, Y. Zhang, Z. Chen, E. Haura, A. Laudano, S. Sebti, A. D. Hamilton, R. Jove. 2001. Phosphotyrosyl peptides block Stat3-mediated DNA binding activity, gene regulation, and cell transformation. J. Biol. Chem. 276: 45443-45455. Gao, H., R. F. Guo, C. L. Speyer, J. Reuben, T. A. Neff, L. M. Hoesel, N. C. Riedemann, S. D. McClintock, J. V. Sarma, R. N. Van, et al 2004. Stat3 activation in acute lung injury. J. Immunol. 172: 7703-7712. Lejeune, D., L. Dumoutier, S. Constantinescu, W. Kruijer, J. J. Schuringa, J. C. Renauld. 2002. Interleukin-22 (IL-22) activates the JAK/STAT, ERK, JNK, and p38 MAP kinase pathways in a rat hepatoma cell line: pathways that are shared with and distinct from IL-10. J. Biol. Chem. 277: 33676-33682. Ferrero, E., D. Jiao, B. Z. Tsuberi, L. Tesio, G. W. Rong, A. Haziot, S. M. Goyert. 1993. Transgenic mice expressing human CD14 are hypersensitive to lipopolysaccharide. Proc. Natl. Acad. Sci. USA 90: 2380-2384. Oesterreicher, C., F. Pfeffel, D. Petermann, C. Muller. 1995. Increased in vitro production and serum levels of the soluble lipopolysaccharide receptor sCD14 in liver disease. J. Hepatol. 23: 396-402. Landmann, R., A. M. Reber, S. Sansano, W. Zimmerli. 1996. Function of soluble CD14 in serum from patients with septic shock. J. Infect. Dis. 173: 661-668. Nockher, W. A., R. Wigand, W. Schoeppe, J. E. Scherberich. 1994. Elevated levels of soluble CD14 in serum of patients with systemic lupus erythematosus. Clin. Exp. Immunol. 96: 15-19. Higuchi, Y., N. Hijiya, K. Matsuura, A. Yasui, T. Uchida, S. Yamamoto. 2002. Mouse soluble CD14 truncated at amino acid 71 in transgenic mice: preventive effect on endotoxin-mediated toxic shock. Pathobiology 70: 103-114. Maliszewski, C. R.. 1991. CD14 and immune response to lipopolysaccharide. Science 252: 1321-1322. Ramana, C. V., M. Chatterjee-Kishore, H. Nguyen, G. R. Stark. 2000. Complex roles of Stat1 in regulating gene expression. Oncogene 19: 2619-2627. Kaplan, D. H., V. Shankaran, A. S. Dighe, E. Stockert, M. Aguet, L. J. Old, R. D. Schreiber. 1998. Demonstration of an interferon-γ-dependent tumor surveillance system in immunocompetent mice. Proc. Natl. Acad. Sci. USA 95: 7556-7561. Pfeffer, L. M., J. E. Mullersman, S. R. Pfeffer, A. Murti, W. Shi, C. H. Yang. 1997. STAT3 as an adapter to couple phosphatidylinositol 3-kinase to the IFNAR1 chain of the type I interferon receptor. Science 276: 1418-1420. Nguyen, H., C. V. Ramana, J. Bayes, G. R. Stark. 2001. Roles of phosphatidylinositol 3-kinase in interferon-γ-dependent phosphorylation of STAT1 on serine 727 and activation of gene expression. J. Biol. Chem. 276: 33361-33368. Zhang, D. E., C. J. Hetherington, S. Tan, S. E. Dziennis, D. A. Gonzalez, H. M. Chen, D. G. Tenen. 1994. Sp1 is a critical factor for the monocytic specific expression of human CD14. J. Biol. Chem. 269: 11425-11434. Look, D. C., M. R. Pelletier, R. M. Tidwell, W. T. Roswit, M. J. Holtzman. 1995. Stat1 depends on transcriptional synergy with Sp1. J. Biol. Chem. 270: 30264-30267. Ouchi, T., S. W. Lee, M. Ouchi, S. A. Aaronson, C. M. Horvath. 2000. Collaboration of signal transducer and activator of transcription 1 (STAT1) and BRCA1 in differential regulation of IFN-γ target genes. Proc. Natl. Acad. Sci. USA 97: 5208-5213. Zhang, J. J., U. Vinkemeier, W. Gu, D. Chakravarti, C. M. Horvath, J. E. Darnell, Jr. 1996. Two contact regions between Stat1 and CBP/p300 in interferon-γ signaling. Proc. Natl. Acad. Sci. USA 93: 15092-15096.